Here is #3 from the Re-ment "Kitchen & Household Goods" series from 2006. 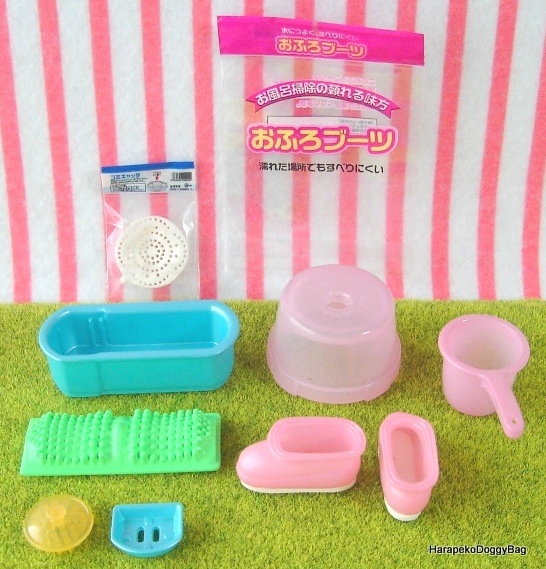 The set includes miniature sized versions of unique and essential items used in everyday Japanese bathrooms. Keywords: Re-ment, Rement, Japanese Toys, Miniature, Miniatures, Dollhouse, Doll House, Puchi, Mini, Kawaii, Cute, Kitchen and Household Goods, Bath, Bathroom, Scrubs, Stool, Sink Drain Strainer, Foot Massage, Non Slip Bathroom Shoes, Scalp Massager, Shampoo and Soap Container.